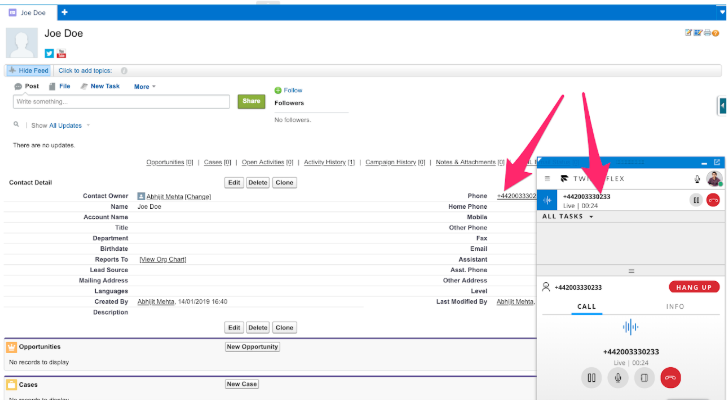 Learn how to accept incoming calls from new and existing contacts and make outgoing calls from your Flex-Salesforce integration. Do you still need to set up your Flex-Salesforce Integration? Check out our guide for configuring your Salesforce instance for Flex! From a unknown contact in your Salesforce account, you can initiate an inbound call, SMS, chat, or any other communication channel configured on your Twilio Flex Project. Read this document to learn on how to add channels to your Twilio Flex instance. Once you accept the incoming call, SMS, or other channel, a popup will appear that allows you to create a new Contact Record. You can change 'Contact' to any other object in your Salesforce account by changing the Call Center Softphone Layout > Screen Pop Setting. See the call flow customization guide for an example. For an existing contact in your Salesforce account, you can initiate an inbound call, SMS, chat, or any other communication channel configured on your Twilio Flex Project. Read this document to learn on how to add channels to your Twilio Flex instance. Once you accept the incoming call, SMS, or other channel, a popup will appear that shows details for the relevant contact. If multiple search results are found for a given contact, the popup will show all results for that contact. Your Flex-Salesforce integration can seamlessly handle multi-tasking when an agent has multiple records. From your Salesforce account, initiate multiple inbound/outbound calls, SMSes, chats, or any other communications channel configured on your Twilio Flex Project. 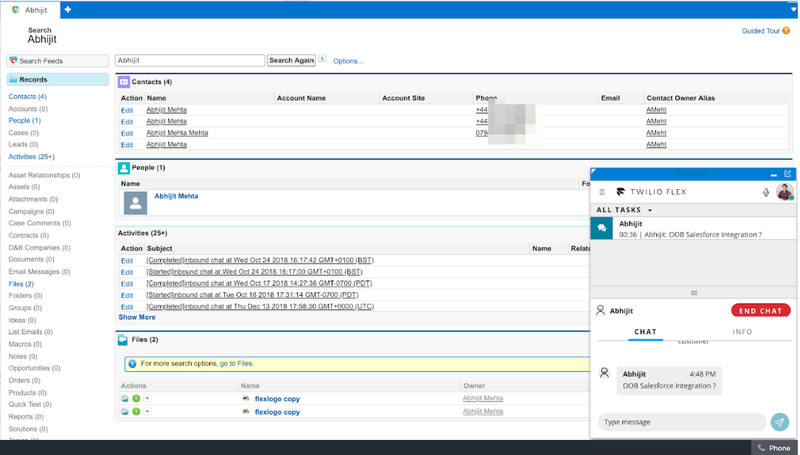 As you select different tasks on the Flex screen, the screen on Salesforce will change to the relevant object: for instance, if you are chatting with Joey, you will see their information until you switch over to your call with Alex, at which point you'll see their information on the screen instead. You can click on any phone numbers in your Salesforce account to initiate an outbound call. 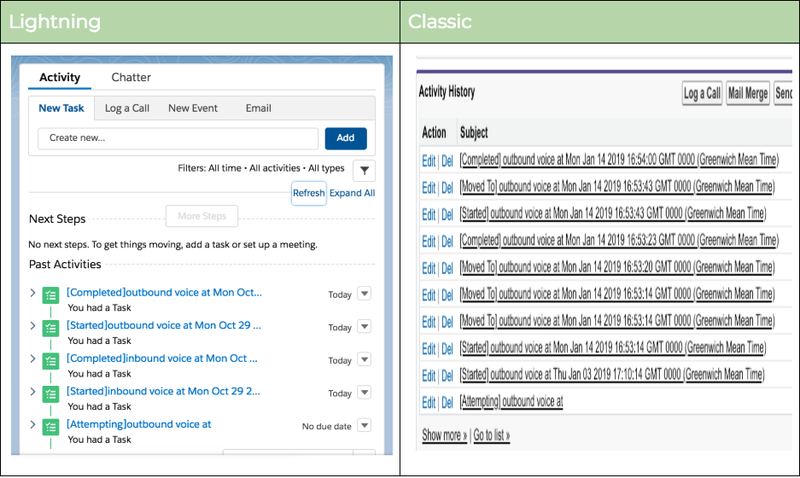 As various events flow through Flex, the activities are auto-logged.